It’s Off to the Races at 5SKS Convention in Swift Current! As we traveled back to North Dakota from the District 5SKS Conference held this weekend in Swift Current, Saskatchewan, my head and heart were filled with warm thoughts of special people and friendships–some longstanding, others newly-made. Wherever we went, Lions welcomed us and gave us every courtesy. Hugs, warm greetings, kind words, and some “ribbing” made us feel right at home. It is great to be part of this Lions family. 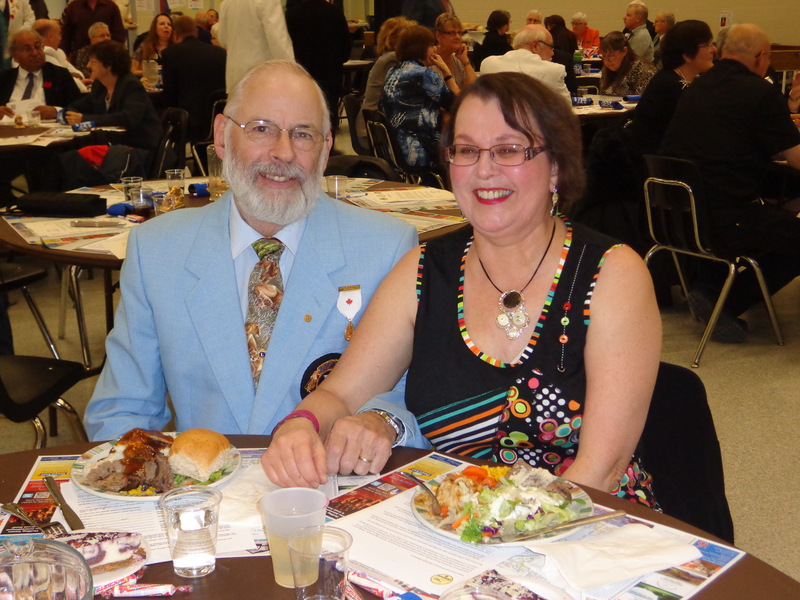 Lion Ron Munro, his wife Lion Susanna, and members of the Swift Current club worked tirelessly to make sure the fall conference went off without a hitch. The convention planners scheduled many excellent programs detailing the projects being undertaken by Lions across the province, including information about the LIONS Diabetes Detection Program, the Reading in Action Program, the STARS Ambulance, the Lions Foundation Guide Dogs, the Saskatchewan Lions Foundation, and the Grasslands National Park, to name a few. The conference schedule was full but speakers kept to their time limits and Lions were very receptive to learning about the different programs. The Swift Current Lions did a great job of hosting the conference. One of the fun activities they planned for the Friday night social was a human horserace where Lions pushed six painted steeds based upon the roll of the dice. As horses took turns surging ahead as their numbers were called, we cheered and placed our wagers on which one we thought would prevail. The different raffles and drawings sponsoredby the convention planners successfully raised nearly $700 for the District Governor charities. 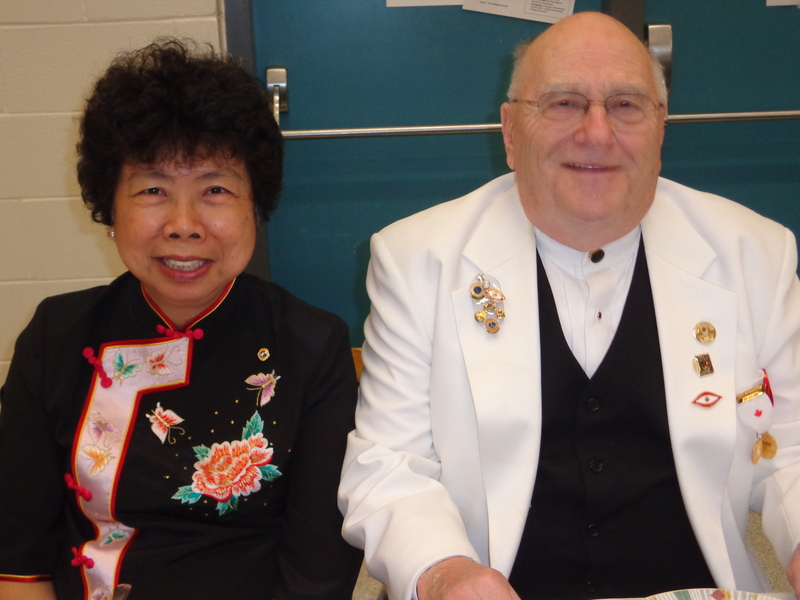 The horse races were fun to watch and provided a light-hearted contrast to the other race shaping between two candidates vying for the endorsement needed from the Lions of Multiple District 5 in order to run for the international board of directors. As one of the candidates for the endorsement, I found my greatest satisfaction in being myself and sharing my commitment to service and hopes and vision for Lions Clubs International. I had the pleasure of joining the conference chair Lion Dan Weber and his wife Lenora at the banquet where Immediate Past International Director Marvin Chambers and his wife Lynne were the featured guests. PID Marvin surprised Lynne with a Melvin Jones Fellow Award. They are such positive role models of selfless service! It was so great to have a chance to visit with them and hear about the activities that now fill their lives. My traveling companions for the weekend were Past District 5NE Governor Lion Mel Olson and Past District 5NW Governor Lion Pat Vannett. We tried to meet as many people as we could as we attended sessions and enjoyed meals together. Lion Mel told the 5SKS cabinet members about the ways my service over the years has contributed to promoting the goals and programs of Lions Clubs International and the LCI Foundation. Lion Pat explained why she and her husband, Past District 5NW Governor Kevin Vannett decided that my commitment to service had influenced their decision to support my candidacy. Both Lion Mel and Lion Pat were articulate and effective spokespeople who set the scene for my remarks to the cabinet and assembly. The support expressed by so many of the convention participants left us with the feeling that our message was received positively. That is gratifying and encouraging. Thanks, Lions of 5SKS for a great weekend! Looking forward to seeing you all again soon! What a wonderful time you must have had with our Canadian friends. Hospitality in Saskatchewan is always laced with fun and friendship. I wish I could have been there with you — I support you all the way!